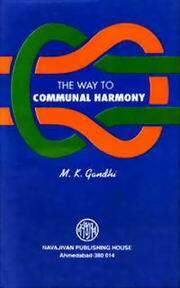 The Way to Communal Harmony is a compilation of Gandhi's reflections on certain problems which divide mankind. Though they deal immediately with India, their validity extends beyond the circumstances of our country. Everywhere in the world, individuals and groups are divided because of fear, suspicion and hatred. It depends on local conditions whether the division expresses itself along religious, economic, political, caste or colour lines. Whatever be the form, insecurity is perhaps the major cause of individual and social dissensions. A person who is integrated and sure of himself fears none and consequently provokes no fear. We have occasional examples of such heroic individuals, but we have not till now had instances, of societies or communities that are fully integrated and therefore fearless. The theme of Gandhi's teachings is that the individual must rise above fear, jealousy and hate. When such individuals combine themselves into a community, the problem of communal jealousy and discord will disappear.